Picture the scene at a Japanese tea ceremony, with nothing but the sound of a whistling pot to break the calm concentration, its vapour slowly rising. An elegant lady receives an urgent call on her mobile (“keitai”). What is the polite thing to do? You may know the familiar regime: slowly picking up the phone trying to subtly take the call with one hand, perhaps trying to shield the phone call with the other. Such politeness is firmly rooted in modern Japanese culture, where it is common to apply both hands, adding a nuance of warmth, respect and dignity. Take the exchange of business cards (“meishi”) with both hands, accompanied by a bow, as a common example. In our ongoing look at the Japanese manufacturing industry, let’s focus on this concept of movement and user interaction. In the production process, mechanics is central. With ongoing technological development, innovation in mechanics can help manufacturers influence consumer behaviour more than ever before. For example, take the mobile phone, which is an intrinsic part of daily life. 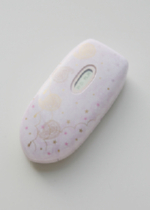 Influenced by the concept of Yamato Nadeshiko (a metaphor for the ideal Japanese woman), manufacturers began to focus on the ideal mobile phone for a woman. In 2006, NTT Docomo came up with the D702iF. It was developed by Mitsubishi and designed by fashion designer, Momoko Ikuta. Appearance was crucial. How could they make a woman look beautiful through the phone she uses? The development team came up with several innovations. With curved casing (christened “Marquise Line”), the smaller form factor offered a more comfortable grip alongside a sleeker profile during calls. 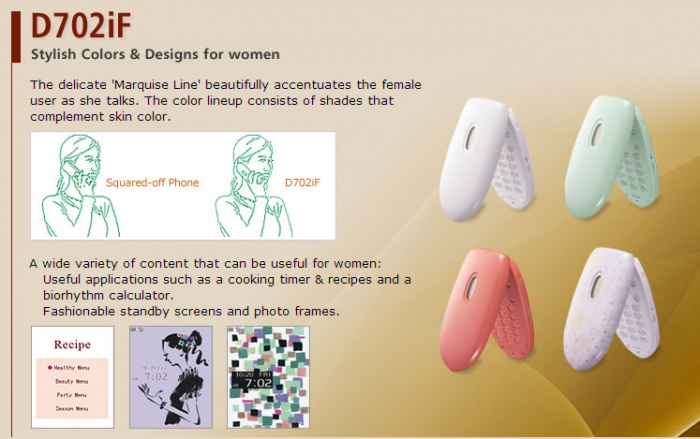 Handset colours were offered in four traditional Japanese shades, known to complement the skin. The design goal was a phone that both exemplified and complemented the beauty of a Japanese woman – usability and visual appeal followed, somewhat inevitably, allowing the device to really influence user behaviour. The history of clothing shares this design order. Originally created to protect against cold or trauma, comfort and visual style very much came at end of the design process. Ikuta-san confirmed to me in interview this phenomenon. Technological advances have paved the way for functional innovation, with improved usability often the driver behind this. It is true for most daily necessities, not just consumer electronics. Japanese manufacturing has progressed from pursuing function to focusing on usability. How easy a device is to use, how intuitive an interface is and how quickly common actions can be performed. If intuitive usability requires instinctive, visual appeal, it is likely the pursuit of one can achieve the other. Take another example. “Auto-closure” was developed to automatically close vehicle doors completely. This innovation was originally developed for ambulances, where time is precious and a slammed door could disturb a patient’s blood pressure. Over time, this same technology was adopted into everyday vehicles such as Toyota’s Lexus and many more since. It is distinctly Japanese to absorb new features wherever there is potential use. 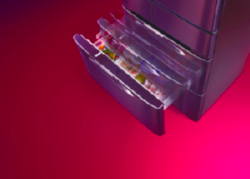 Hitachi and Mitsubishi Electric began to equip their refrigerators with this feature. This extra functionality symbolises Japanese manufacturers’ commitment to the consumer’s quality of comfort. Hitachi’s “Tappuri Big Sumizumi Cool” refrigerator, with auto-opening and closing drawers. With Hitachi’s refrigerators, auto-closure could prevent leakage of cold air from a half-open door. Both functional and energy efficient, there were obvious usability gains too, if you consider the obstacle to the average consumer that is the heavy door to an increasingly large, modern refrigerator. The difference between Western and Japanese style can be described by an extra elegance or subtle audacity embedded in Japanese design. Consideration of this is essential in developing effective design. The Japanese style attaches greater importance to modesty and subtlety and is conveyed in the product designs so far discussed. Ikuta-san’s work on the D702iF project was her first experience of consumer electronic design. From her haute couture background, where handwork is key, it is easy to see how the experienced seamstress relies on the designer for an accurate concept, while the designer relies on the seamstress to bring the illustrations to life. Ikuta-san was surprised by the determination of the technical staff at Mitsubishi Electric and by their incredible attention to detail. They were determined not to compromise on effort or loosen their control of any part of the project until they themselves were satisfied with the end result. You can see how this harmonious approach differs to the specialisation approach of the seamstress and the designer. Ikuta-san highlights the risk presented by the modern trend of division of labour in the production process. Leveraging Japanese people’s strength in thoroughly investigating every angle, team members can understand, relate and work better together, forming a kind of workplace harmony. Regarding future development, I can see the benefit of paying equal attention to all intrinsic parts of the manufacturing process: planning, design, development and production. In doing so, we can achieve this harmony. Looking to the future, the next era of handheld devices is likely to be dominated by “wearable computing”. What started with the Walkman and the mobile phone will continue as the distance between ourselves and our devices will become ever minimal. It is not just a functional consideration or desire to stand out, but component dimensions will continue to shrink allowing us to achieve new standards in miniaturisation. Just like Docomo’s Marquise Line, perhaps our future coats and jackets, with their buttons behaving like switches, could allow us to achieve a more seamless, natural usability? Understanding the production process and realising the renewed focus on usability and style will surely benefit the profitability of Japanese manufacturers going into an increasingly competitive global marketplace.